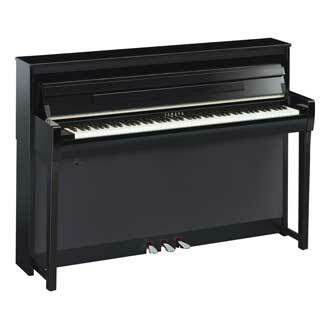 The Yamaha Clavinova CLP-685 digital piano represents peak style and performance in the Clavinova CLP series. The CLP-685's GrandTouch keyboard action boasts linear graded hammers and individual key counterweights for unrivaled realism and response. Yamaha CFX and Bosendorfer Imperial grand pianos sing through the 300 watt, three-way speaker system with spruce speaker cones, while Binaural CFX technology delivers an immersive headphone experience. Other features include Bluetooth audio, synthetic ebony and ivory keytops, and practice and recording functions.